If you're looking for an all-in-one cleanup and tuneup tool, you'll be pleased with Ashampoo WinOptimizer 7 ($50, ten-day free trial). It performs just about every task you might want, including cleaning your Registry, clearing out unnecessary programs that run on startup, undeleting files, defragmenting your hard disk, tweaking the way Windows works, and plenty more. There's also a very useful one-click optimization tool. 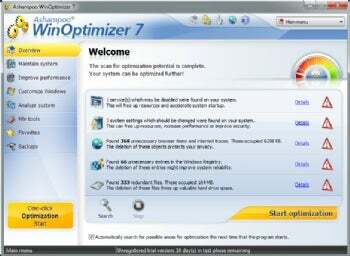 Ashampoo WinOptimizer 7 sports a nifty interface that makes it easy to tune up and optimize your PC.